L to R: Mark Spung-Wiles, Aaron Pennington, Drew Whitley, Dalton Cole. The Plaids and their glorious four-part harmonies are back in Pelzer just in time for Christmas. 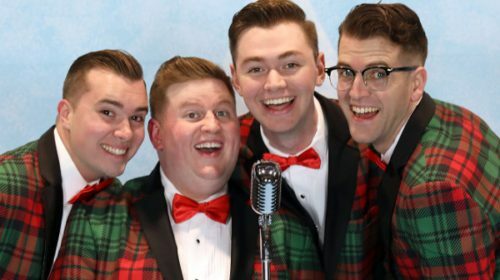 These four young men who perished in an accident with a bus and returned to earth for one final hilarious evening of musical inspiration in “Forever Plaid – grace the Mill Town Players once again with a Yuletide theme in “Plaid Tidings” through December 16 at the Historic Pelzer Auditorium. Drew Whitley is back as the group’s asthmatic leader Frankie, as are Aaron Pennington as teh shy Jinx, and Dalton Cole as Smudge, the Buddy Holly lookalike. Mark Spung-Wiles, replaces Johnny Culwell, who is in graduate school, as the class clown Sparky. At first, these fine young lads aren’t sure why they’ve returned to Earth for another posthumous performance, but a phone call from the heavenly Rosemary Clooney lets them know that they’re needed to put a little harmony into a discordant world. Written by Stuart Ross, “Plaid Tidings” sprinkles among the Christmas offerings audience favorites, like their riotous three-minute-and-eleven-second version of The Ed Sullivan Show – this time, featuring the Rockettes, the Chipmunks and The Vienna Boys Choir, as well as a Plaid Caribbean Christmas that puts the “Day-O” in Excelsis! “Returning to this show with Drew Whitley and Dalton Cole has been a blast and we have welcomed Mark Sprung-Wiles into the plaids with open arms and he has fit in perfectly,” Pennington told Carolina Curtain Call. “We are constantly lifting each other up and this has produced a strong bond between us four.I love these guys!,” he added. And how does this sequel compare to “Forever Plaid”? “In my opinion this show is funnier and has many more harmonies…and lots more dancing,” he said, thanking you Kimberlee Ferreira, who is also back as director and choreographer, as well as musical director by Chase McAbee. Tickets are only $12, with discounts for seniors, military, and students, and can be purchased online atwww.milltownplayers.org, by calling (864)947-8000, or at the door.